FaithAction has been researching the core ‘ingredients’ that make community. We undertook case studies of ten community ‘hubs’, with backgrounds in a variety of faiths and no faith, and analysed them to identify the core themes that make up community. 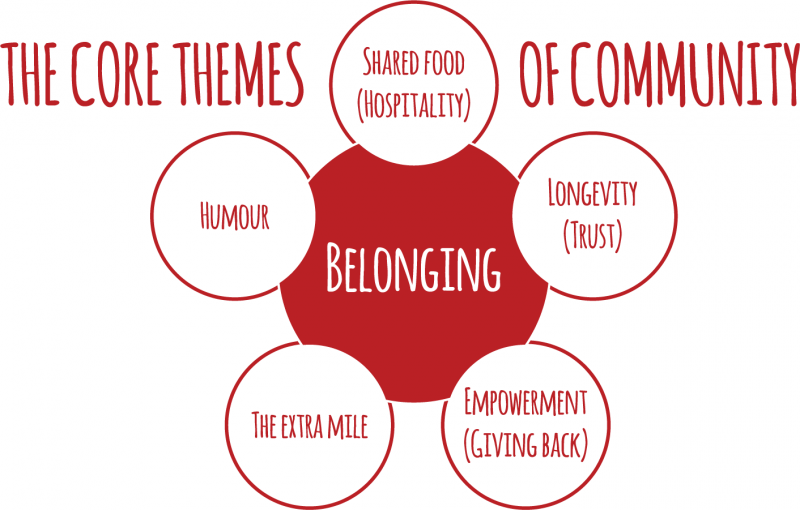 We characterised these themes as: belonging; shared food and hospitality; longevity (which breeds trust); creating a team who want to go the extra mile; empowerment (which often means people ‘give something back’); and the importance of humour. Download the report to read more. The report provided the basis for a roundtable discussion at the House of Lords, chaired by Lord Farmer and Avril McIntyre of Community Resources and attended by policy makers, practitioners and researchers. The discussion highlighted how community is like the ‘expanding foam’ or ‘glue’ that helps stop people falling through the gaps. The family and community support provided by the voluntary and community sector cannot and should not replace professional services, but equally it offers things that professional services can’t. How we go about nurturing strong relationships within families and communities, and how we ensure professional services and community provision are connected in all the right ways, are important questions that FaithAction and Community Resources will continue to explore over the coming months, and we are planning further research to help us understand more.